2018 Feast Day Mass plans under way! 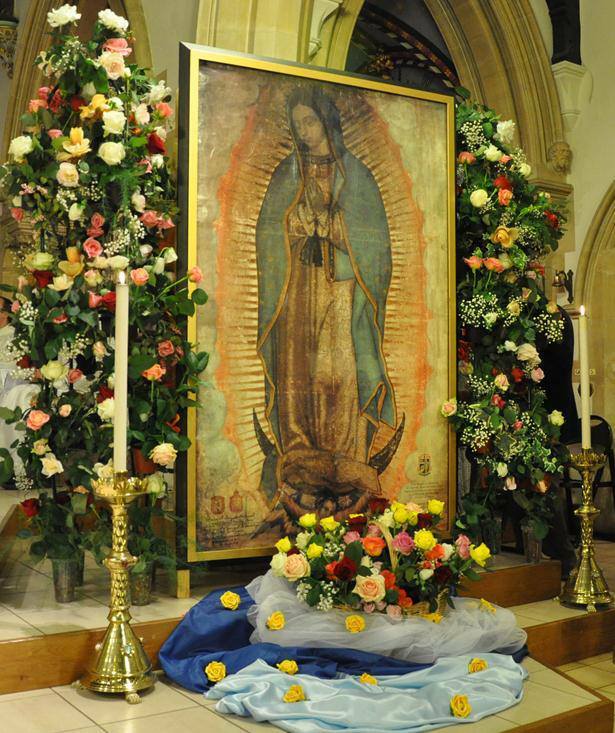 The Shrine of Our Lady of Guadalupe in Bedford will be welcoming a very important guest on Wednesday, 12th December at 7.30 pm. Archbishop Edward Adams, Papal Nuncio, has confirmed that, unless unavoidably prevented, he will be our Principal Celebrant. Invitations have already been sent out for this important event, Musical Director Michael Moloney is composing new music for the event, and the flower arrangers are planning their usual beautiful arrangements. 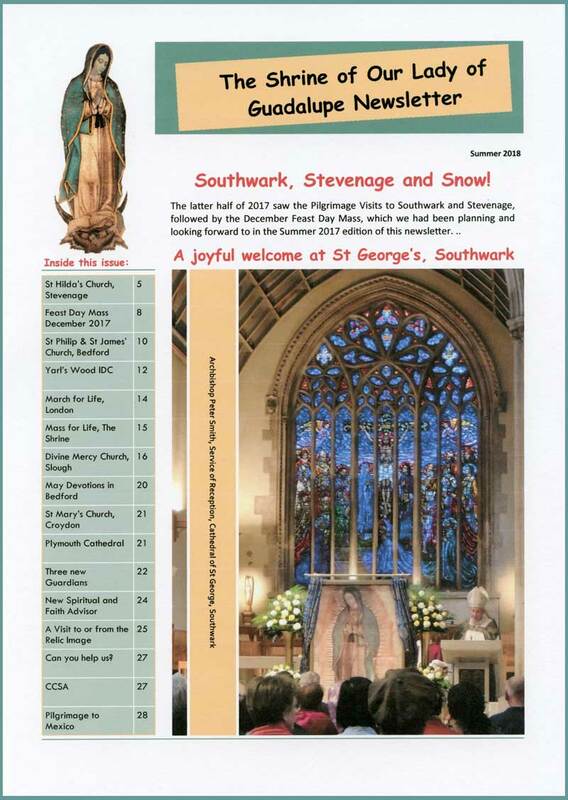 Guardians of Our Lady of Guadalupe from all over Great Britain will be joining distinguished Knights of St Columba, many priests and other guests representing Catholic organisations and friends met on the Pilgrimage Tours at this wonderful celebration. 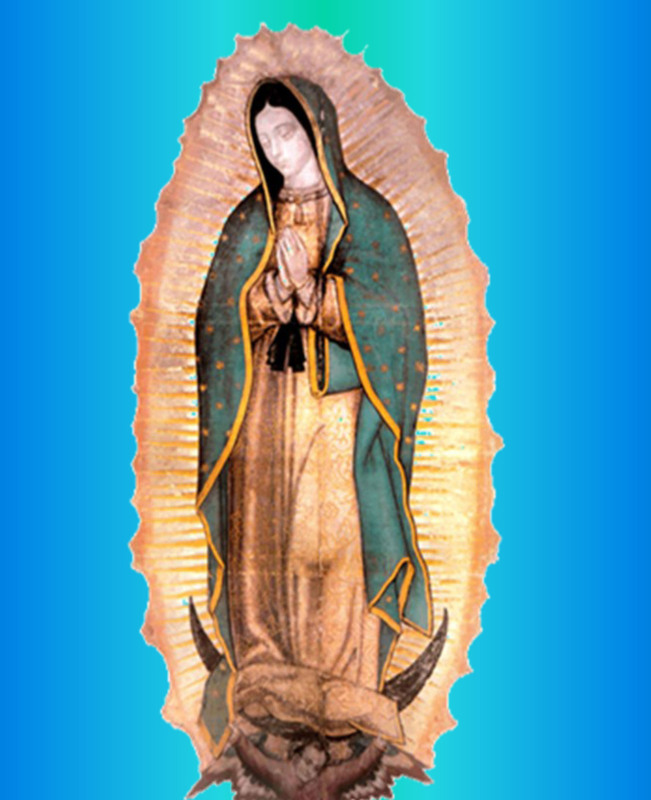 Our Lady will be honoured with music and a beautifully decorated church. The Feast Day Masses are always joyful and uplifting occasions and the spirit of the evening will continue after the Mass with a reception in the nearby hall of St Frances Cabrini Church, 10 Woburn Road, Bedford MK40 1EG. If you would like a personal invitation, we would be very happy to send you one. Please contact the Guest Co-ordinator, Barbara Kay, on 01234 340759 or e-mail mbky3@outlook.com. The Holy Child & St Joseph Catholic Church, home to the Shrine of the Relic Image of Our Lady of Guadalupe, Midland Road, Bedford MK40 1HU. We ask, if possible, that you please arrive by 7.00 pm and, if you are coming in a large group, to contact Barbara Kay direct and we can advise about coach parking, drop off, etc. Parking around the church is very limited, although there is ample public car parking nearby. A town centre map and car park information are available on Bedford Borough Council’s website. An excerpt of the town centre map is available below. The Pilgrim’s Progress (42 Midland Road, Bedford MK40 1QB, tel 01234 363751) – a Wetherspoon hotel in the town centre, just a few minutes’ walk from the church and a short taxi ride from the train and bus stations. The Premier Inn (Riverside Square, Bedford MK40 1PX, tel 0871 622 2418) – a brand new hotel in the town centre overlooking the river, but within easy walking distance of the church. Bedford Travelodge (Bedford Heights, Brickhill Drive, Bedford MK41 7PH, sat nav postcode: MK41 7PH, tel: 08719 846276 ) – in a pleasant suburb of Bedford, but only a short drive from the town centre and with plenty of parking.